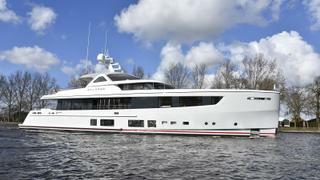 Dutch yard Mulder has delivered the second hull in its flagship ThirtySix yacht series named Calypso. The 36 metre yacht, previously known as Mulder BN 110, left the Zoeterwoude-based shipyard last week and immediately hosted more than 130 guests at the owner's delivery party. The full aluminium yacht is now being readied for her maiden trip to Malta, after which she will attend the MYBA Charter Show in Barcelona. Following her delivery, Calypso will be available for charter in the Mediterranean. Calypso marks the third project built in collaboration with the British firm Claydon Reeves Design Studio for exterior design and Van Oossanen for naval architecture. The interior design has been handled by John Vickers, who has created a "relaxed luxury beach style" by "blending Cote d'Azur chic and the spirit of Ibiza". The result is a design of "laid back sophistication". A five-cabin layout will accommodate 10 guests, while the crew quarters allow for a staff of five. Key features include floor-to-ceiling windows around the saloon and bar area, and the dining room will include a fold-down superyacht balcony for unimpeded views out to sea. Toy storage meanwhile is ample, with the side-loading tender garage capable of housing a main tender measuring up to 6.25 metres, as well as two Jet Skis, kayaks, Seabobs and diving gear. The side-opening hatch is just one way of interacting with the water as Calypso will also boast a generous open-stern superyacht beach club. Power comes from a pair of 1,136hp Caterpillar C18 diesel engines for an estimated top speed of 16.8 knots and a cruising speed of 15 knots.